The work, developed by a team of researchers from the University of California Berkeley, allows anyone to portray themselves as a world-class ballerina or a pop superstar like Bruno Mars. Using NVIDIA TITAN Xp and GeForce GTX 1080 Ti GPUs, with the cuDNN-accelerated PyTorch deep learning framework for both training and inference, the team first trained their conditional generative adversarial network on video of amateur dancers performing a range of poses filmed at 120 frames per second. Each subject completed the poses for at least 20 minutes. The team then extracted pose key points for the body, face, and hands using the architecture provided by a state of the art pose detector OpenPose. 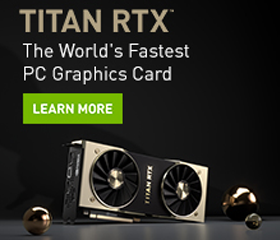 For the image translation, the team based their algorithm on the pix2pixHD architecture developed by NVIDIA researchers. 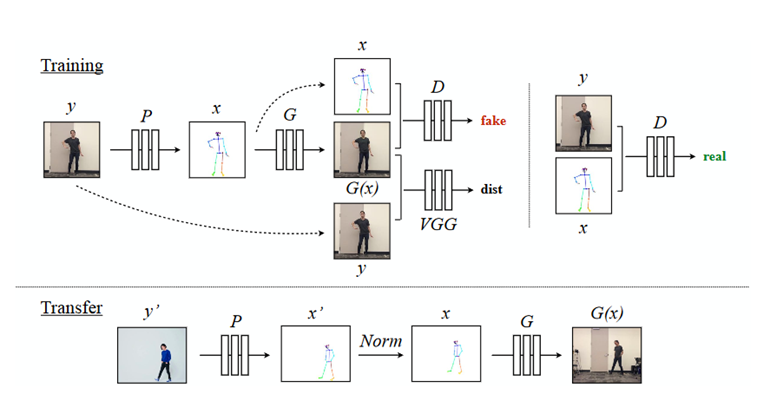 Training : Our model uses a pose detector P to create pose stick figures from video frames of the target subject. During training we learn the mapping G alongside an adversarial discriminator D which attempts to distinguish between the “real” correspondence pair ( x , y ) and the “fake” pair ( G ( x ) , y ) . (Bottom) Transfer : We use a pose detector P : Y ′ → X ′ to obtain pose joints for the source person that are transformed by our normalization process N or m into joints for the target person for which pose stick figures are created. Then we apply the trained mapping G.
“Overall our model can create reasonable and arbitrarily long videos of a target person dancing given body movements to follow through an input video of another subject dancing,” the team said. The researchers concede their model isn’t perfect. “Even though we try to inject temporal coherence through our setup and pre smoothing key points, our results often still suffer from jittering. Errors occur particularly in transfer videos when the input motion or motion speed is different from the movements seen at training time,” the team explained. To address the issues the team is working on using a different pose estimation framework that is optimized for motion transfer.